Behold something great, something riveting, something enchanting, something mesmerizing, something heartfelt and something authentic. That is The Perks of Being a Wallflower, my favorite movie of 2012 so far. Brought to you by the producers of Juno, the movie is set in the early 1990s in a town in Pennsylvania. Charlie (Logan Lerman) is a fifteen year old starting high school and dreading it. He meets Patrick (Ezra Miller) and Sam (Emma Watson), two seniors, who open him up to the many things he’s missing out on life and lead him on a path of growth that will change him forever and help him deal with this tormented past, which is told in flashbacks. 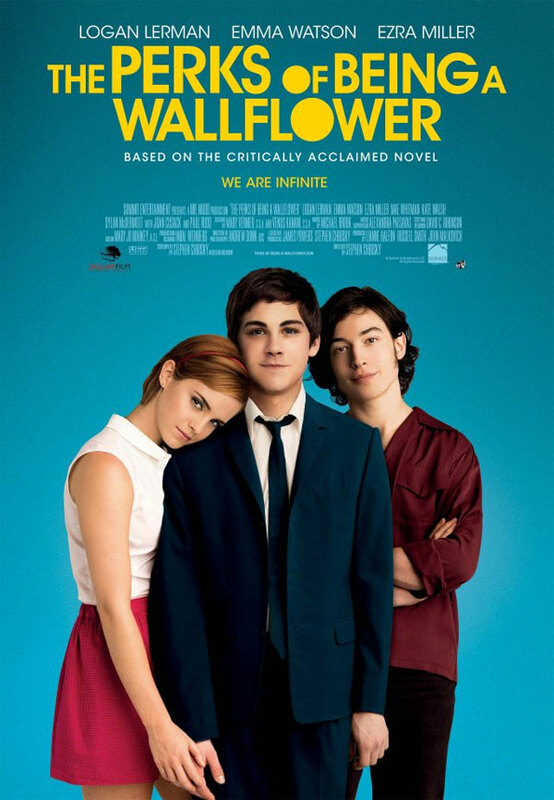 The movie is based on the novel by Stephen Chbosky who actually wrote and directed the movie, which made the experience much tighter and the movie much more faithful to the original material than any other book adaptation I’ve seen. Chbosky may not be a filmmaking expert but he sure did a beautiful job in The Perks of Being a Wallflower. His take on his story gives depth to the book. It is one of the rare instances when what you read on paper is given life on screen – one that you want to see as it adds to what you’ve read. So if you haven’t read the book, I suggest you do so before watching the movie. It will only take you a few hours. And check out my review of the book here. The movie is bolstered by the strong performances by its lead actors and actress. Lerman gets across Charlie’s insecurities and vulnerabilities in a way that seems effortless. Watson completely leaves behind any hints of Hermione (take notes Kristen Stewart) and exposes you to a whole different spectrum of her acting skills. Miller, as the guy struggling with his sexuality, is effervescent and joyful and haunting. The Perks of Being a Wallflower is a movie about the joy of being accepted and the fear of loss, all in the mind of a fifteen year old trying to make sense of growing up. It is a sometimes grim and at other times funny look at the lives of these kids as they struggle with abuse, loneliness, social norms, homophobia and love, all in a high school setting spanning one scholastic year with all of its ups and downs. It is a movie that isn’t unlike other movies you might have seen before but it’s just so much better. It doesn’t have the cliches you’d expect from a high school drama. But it definitely has all the components to make it relatable and sweet and, well, irresistible. The music in it is great too. You can’t but feel elated as The Perks of Being a Wallflower enters its last scene. You can’t but have a smile on your face as you see the tunnel flash in front of you and as Charlie stands, your emotions too will stand. And in that moment, I swear, you will be infinite. This entry was posted in Movies and tagged Emma Watson, Ezra miller, Logan Lerman, movies, Stephen Chbosky, The Perks of Being a Wallflower. Bookmark the permalink.